A range of Andrews Sisters vocal trio sheet music for big band and jazz orchestra. 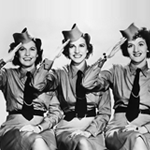 Who were the Andrews Sisters? The Andrews Sisters were an American vocal trio who performed from the mid 1930's to the late 1960's. The trio was made up of LaVerne, Maxene and Patty and over their long career they sold over 75 million records. They began by imitating the Boswell Sisters, though under the guidance of their orchestra leader and arranger, Vic Schoen, they had become household names by the 1940's. The Knapp brothers, Jack and David, who founded the Decca record label made a big contribution to their success. Which charts are they most well known for? Whilst they performed with many of the leading bands of the era such as Glenn Miller, Tommy Dorsey and Benny Goodman, their biggest hits came under their own name. "Bei Mir Bist Du Schoen" was their first big commercial success in 1938, followed by others such as "Boogie Woogie Bugle Boy", "Hold Tight", "Shoo Shoo Baby", "Don't Sit Under the Apple Tree" and "Don't Fence Me In" - with Bing Crosby.